Proof of how The Beatles are regarded as the greatest band the world has ever produced is the fact that most people, music lovers or not, seem to know a little something about the Fab Four. Like one of the mop tops once said they’re more popular than Jesus Christ? Or that "Hey Jude" is one of their greatest hits? Well, these are largely popular trivia and one need not be a Beatle fan to know. But hey, isn’t it interesting to have good access to some things only Beatle fanatics would know? Would it not give you a ‘yeah, yeah, yeah’ feeling if suddenly you realized there are real cool stuffs about John, Paul, George, and Ringo that you should have known? Here are few things about them culled from "The Beatles: The Complete Illustrated Story " by Terry Burrows," "The Beatles Anthology " by The Beatles, "The Beatles: A private View" by Robert Freeman" and "The Love You Make" by Peter Brown and Steven Gaines. Come together, read on. • The Beatles’ third studio album "A Hard Day’s Night " is the only album in Beatles’ career that exclusively contains Lennon-McCartney compositions. Since it was agreed that any song written by either John or Paul is credited as a Lennon-McCartney creation, people are not really sure who between the two got the better number. Anyway, for this album, John Lennon is said to have largely written 10 of its 13 tracks. • There are only seven persons allowed in the Beatles’ magic circle. Aside from the Fab Four, the only ones allowed inside the recording booth are record producer George Martin, road managers Neill Aspinall and Mal Evans. Not until John fell for Yoko Ono who even had a bed inside the studio. • The sleeve of the Beatles’ first LP (equivalent to what is called an album today) called "Please, Please Me " had the distinction of having credited John and Paul’s compositions as McCartney–Lennon instead of Lennon–McCartney. One reason could be the fact that the first two Beatle songs chosen to be put on record (by the group’s producer) are "Love Me Do" and P.S. I Love You," both McCartney compositions. • Lennon first wore his famed round eyeglasses during the shooting for the film "How I Won The War " where he had a cameo role. It was believed that while in-between shoots, he was writing a song later to be known as "Strawberry Fields Forever." • What do Beatle classics "Michelle," "In My Life," "Here, There, and Everywhere," "And I Love Her" and "I Will" have in common? They’re all not included in the album "1" which contains 27 Beatle songs that reached no. 1 on the charts during their heydays. "Strawberry Fields Forever," another Beatle classic, was the first Beatle single which didn't make it to the top spot on its release. • John’s "Julia," which appeared on the Beatles White Album and a song dedicated to his late mother Julia, and wife Yoko, was the only Beatle song wherein he played alone, without assistance from the rest of the group. Paul McCartney had done the same many times. In "Yesterday," string instrumentalists helped him record what would be hailed as the most covered song of all time. • Before writing "While My Guitar Gently Weeps," George Harrison randomly picked a book on a shelf, opened it and read the first word he saw. The word was ‘gently.’ Incidentally, legendary Eric Clapton played the crying ‘lead part’ of the song. He was the same man George was waiting for at a garden one morning when he started writing ‘Here Comes The Sun." • Paul, married to photographer Linda Eastman for 29 years, could have been the only Beatle who didn’t remarry. John’s first wife was Cynthia Powell. George had Patti Boyd, while Ringo tied the knot with Maureen Cox. They all gave marriage a second time due to failed relationships. Paul, on the other hand, married his current wife Heather Mills a few years after Linda died of cancer. • John Lennon considered his lyrics on "Across The Universe" as one of his bests, if not, his best. He described it as a "piece of poetry that strongly stood alone, without the help of its melody." John had to wake up from his bed to finish the song after its melody kept ringing in his ears. - John Lennon saw a UFO in 1974. He ran around shouting, "Here I am! Come and get me!" (He wrote about it on Double Fantasy. "There's UFOs over New York, and I ain't too surprised." - The Beatles performed 'All You Need Is Love' to a world wide audience of 400 million by means of a satellite link up. - George got drunk in Hamburg and threw up on the floor. None of them wanted to clean it up, so they left it there and watched it get more disgusting every day. It became an inside joke and they called it a "fiendish thingy." Thus the George famous 'fiendish thingy' saying. - Ringo wanted to be a hairdresser. - Paul and Pete Best got arrested in Hamburg after sticking a condom to the wall and setting it on fire. - The real source of the Beatles song Maxwell's silver hammer. The chorus had always seemed a bit obscure: "Bang, bang, Maxwell's silver hammer came down on her head. Clang, clang, Maxwell's silver hammer made sure that she was dead." But Paul McCartney had been born Catholic, and was inspired by the Vatican ritual where a cardinal bangs the late pope on the forehead five times with a silver hammer, while calling out his real name, to make sure that he is dead. - The Beatles "1" album , reached number one in 34 different countries. And sold 20 million copies. - The tv series 'The Beatles Anthology ' was watched by 420 million people, in 1995. - The Beatles created MTV. They were the first group to create a music video to sell their music. Based on a 17th century poem by Thomas Dekker. Paul McCartney wrote this on his step-sister's piano. He saw the song "Golden Slumbers" in her songbook and, unable to read music, made up his own using most of the original lyrics. John Lennon and George Harrison did not play on this. Before they broke up, The Beatles recorded a lot of their songs separately. Part of a suite of songs at the end of Abbey Road. It was the last album The Beatles recorded, although it was released before Let It Be. Recorded as one song with "Carry That Weight." 1) Paul McCartney wrote "Come and Get It" for Badfinger. Name two songs that Paul brought in to Badfinger for evaluation and feedback purposes only! 2) Did Capitol Records ever release a Beatle's album simultaneously around the world? 3) During the making of George's "33 1/3 " album, George was suffering from jaundice. This illness caused delays in recording many of the tracks but George did manage to get out of bed one day to record a song. In this song, he dubbed the instrumental break as having a "mysterious yellow guitar sound." Which song was George referring to? Was it "Woman Don't You Cry For Me"; "True Love"; or "Learning How to Love You"? 4) Did our noble Knight -Sir George Martin- ever go "streaking in the buff" in the recording studio before the Beatles? 5) This one is a Travelling Wilbury question...If Bob Dylan was LUCKY WILBURY, Jeff Lynne as OTIS WILBURY, Roy Orbinson as LEFTY WILBURY, George Harrison as NELSON WILBURY and Tom Petty as CHARLIE T. JR. then name the "studio musician" who was dubbed as a "Sidebury Wilbury". 6) During Badfinger's recording of "Rock of Ages", who plays the piano on that number? Was it Nickey Hopkins? Al de Lory? Paul McCartney? or Billy Preston? 7) True or False: When the Beatles were touring, did one of the Beatles air flights between between shows have to make an emergency landing? 8) Who was the first Beatle to be interviewed by Rolling Stone magazine? 1) According to an interview with Tom Evan's called "Apple Daze", the two songs that Paul brought in for Badfinger's purusal was "Hey Jude" and "Maybe I'm Amazed." 2) The Beatles never had an lp released simultaneously around the world. The only group who ever able to do that was Beatle impersonators "Klaatu" with their album "Hope." Capitol made arrangements to have Klaatu's "Hope" album released simultaneously around the world and that's something not even the Beatles were able to achieve as a status within their own musical legend. 3) On a C.B.C. 1976 radio interview, George Harrison's "mysterious yellow guitar sound" appears on his song called "Learning How to Love You" on his "33 1/3" album. 5) Concerning who was the *other Travelling Wilbury regarding a session musician, it was Jim Horn who got dubbed as "Sidebury" Wilbury. ** Source: Pet Sounds Sessions Box Set interview with Jim Horn. 6) According to "Apple Daze" an interview with Tom Evans, it was Paul McCartney who played the piano on "Rock of All Ages." 7) True! The Beatles did have to make an emergency plane landing between tours. This occurred when they were on their way to Alaska to Japan. Apparently a snow storm appeared and the pilot was forced to make an emergency landing in Alaska. The Beatles were grounded for 18 hours there before they headed off to Japan for the concert date. 8) Ringo Starr and George Harrison were the first Beatles to be interviewed by Rolling Stone Magazine. Their interviews appeared on February 10, 1968 in issue number 5. Written by John Lennon, it was one of his favorites. He especially liked the lyrics. The refrain "Jai Guru Deva Um" is a mantra intended to lull the mind into a higher consciousness. The words are in Sanskrit, and they mean "I give thanks to Guru Dev," who was the teacher of The Maharishi. The "Um" at the end is the drawn out "oooohm" used in meditation to relate to the natural vibration of the universe. This first appeared on No One's Gonna Change Our World, a charity album for the World Wildlife Fund (They're the ones who sued the World Wrestling Federation and made them stop using "WWF"). Bird noises were dubbed in to this version to create a nature theme. For a while, this was not going to be part of Let It Be . The album was going to be called "Get Back" and was supposed to be recorded in front of a live audience for a TV special, with film footage of The Beatles practicing the songs in the studio used for a companion special. 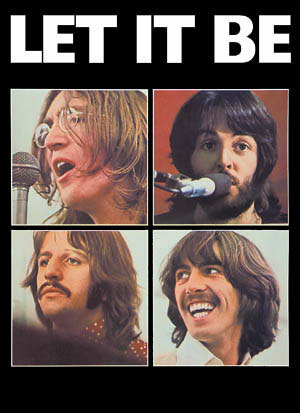 When things didn't go well, they decided to scrap the TV project but use the footage for their last movie, which became Let It Be. The tapes of them practicing in the studio would be worked into an album to go with the film. The first version of the album did not include this, but when the movie was edited, it included a scene where The Beatles play this, so it was added to the album. While the Let It Be movie and album were being sorted out, The Beatles recorded their last album, Abbey Road, and then broke up. George Harrison and John Lennon asked Phil Spector to take the tapes from the Let It Be project and produce the album from them. Spector took out the bird sounds, slowed the tape down, and added an orchestra and choir. The result was a very lush arrangement using his "Wall Of Sound" technique. This was later recorded by David Bowie with Lennon on guitar. It appears on Bowie's 1975 album Young Americans. This was originally going to be the B-side to "Lady Madonna," but "The Inner Light" was chosen instead. (thanks, Adrian - Wilmington, DE) Fiona Apple covered this in 1999. At the 2001 John Lennon tribute special at Madison Square Garden, Sean Lennon performed this with Moby and Rufus Wainwright. Moby wore one of John's shirts that Sean gave him. This was a huge influence on Liam Gallagher from Oasis. It turned him on to The Beatles and inspired him to write songs. At the 2005 Grammy awards, Brian Wilson, Alicia Keys, Tim McGraw, Bono, Stevie Wonder, Norah Jones and members of Velvet Revolver played this as a tribute to tsunami victims in Asia. The single was sold to raise money for the victims. 1 Come Together, 2 Something, 3 Maxwell's Silver Hammer, 4 Oh! Darling, 5 Octopus's Garden, 6 I Want You (She's So Heavy), 7 Here Comes The Sun, 8 Because, 9 You Never Give Me Your Money, 10 Sun King, 11 Mean Mr. Mustard, 12 Polythene Pam, 13 She Came In Through The Bathroom Window, 14 Golden Slumbers, 15 Carry That Weight, 16 The End, 17 Her Majesty. Paul McCartney - Bass, Vocals, Moog, Guitars, Piano, Electric Piano, Wind Chimes, Tape Loops, Harmonium. - John Lennon - Guitars, 12 String Guitar, Vocals, Drums, Piano, Hammond Organ, Moog. George Harrison - Guitars, Vocals, Moog, Harmonium, Bass. Ringo Starr - Drums, Vocals, Percussion. Billy Preston - Hammond Organ. George Martin - Lowry Organ, Harpsichord. Mal Evans - Anvil. Mike Vickers - Moog. Engineers: Geoff Emerick, Phil McDonald, Glyn Johns, Jeff Jarrat, Barry Sheffield, Tony Clark. Recorded at Abbey Road Studios, London, England between 22nd February & 1st August 1969. On the 26th September, 1969, The Beatles released their final album Abbey Road (working title: Everest). It was the last album to be recorded by The Beatles and was named after the North London road where EMI's recording studios were located. Only after the album's success did EMI rename the studios 'Abbey Road Studios'. The album spent 11 weeks at number one and initially sold over 5,000,000 copies earning a Grammy award for ' Best Engineered Non-Classical Recording'. It was the Beatles first 'stereo' release. To date, The Beatles, have remained the world's most successful pop group; often credited with supplying the world with 'the soundtrack of our lives' throughout the sixties in particular, and so their final album deserves perhaps a more detailed close-up review than I would normally give a 'classic album'. Recorded in the summer of 1969, Abbey Road features some of the finest songwriting, musicianship, engineering, and production ever to have been contained and subsequently immortalized within the four walls of the world's most famous recording studios, in fact, to this day, visitors from all over the world cite Abbey Road as one of the most popular tourist attractions where people are photographed walking across the famous 'zebra' crossing, and where graffiti has adorned the studio walls since the Beatles were in residence. I'm fortunate enough to have visited Abbey Road Studios on a number of occasions and yes, I have the photographs of my little walk across the zebra crossing too! It would appear that The Beatles somehow knew that this would be their last album together (The Beatles last studio appearance where all four were in the studio together was 20th August 1969), and conversations with Beatles producer 'Sir' George Martin have confirmed that, in his eyes, it was one of the reasons why they gave their very best both musically and performance wise. The album opens with Lennon's Come Together; a mid tempo and lyrically rich and colorful rock song that features some superb bass playing from McCartney. The lyrics were still considered to be a little risque for the time but John was no stranger to pushing limits in 1969 and beyond in both his private/public life as well as in his songwriting. The track is followed by George Harrison's Something, which I consider to be one of the most sincere and most beautiful love songs ever written. The guitar phrases and solo, coupled again with McCartney's highly skilled, melodic and sweeping bass playing, embrace and captivate the listener into a sense of timelessness, and with George's lyrics and vocals, it's hardly surprising that the song has remained one of the best written and most popular tracks on the album. McCartney's Maxwell's Silver Hammer was typically going to be the song that made John cringe with it's 'When I'm Sixty Four' lyrical approach and it's North of England working class humour. In fact, although Lennon is co-credited with the writing of the song, he did not appear on the recording. Oh Darling! features one of McCartney's best vocal performances on the album, and certainly one of his best 'rock-based' tracks with the Beatles. Musically, the song is outstanding and features excellent playing with John on piano and vocals, and George contributing Guitar, Moog, and backing vocals, but Paul's richly decorated bass lines and hard edged vocals are indeed something to behold! Octopus's Garden is Ringo's epitaph on the album but no other drummer in the world could have contributed their skill and expertise in quite the same way as Ringo had for the Abbey Road sessions. The Beatles were masters of audience capture, and there was little doubt that all age groups could be catered for even when it included a 'children's song' like 'Yellow Submarine' or Octopus' Garden. I Want You (She's So Heavy) is John's rock and roll sentiment featuring 7 minutes of superb vocals and guitar inventiveness as well as John's moog and organ contributions. It was a song that would inspire much musical development in band's such as Pink Floyd, Led Zeppelin, ELO and many many others that have become household names since. The creative musical genius shared between The Beatles and their engineering and production teams saw to it that the best song on the planet to follow 'I Want You' would be George Harrison's second excellent contribution; 'Here Comes The Sun'. Again, John Lennon did not appear for the sessions and so much of the musical inventiveness here is essentially the product of both Paul and George working on a masterpiece. Lyrically, the song is exceptional in it's bright and uplifting, positive and endearing construction. The vocals and guitar playing are exceptional too, and interestingly, George essentially sets the mood for the second side of the album. George's classic is followed by the very beautiful and astonishingly rich harmony driven 'Because', a song that defined what was possible in the minds of multitracked vocal experts in 1969. Although Brian Wilson and the Beach Boys had long been experimenting with four part harmony throughout their career, they had never quite managed to captivate in quite the same way as The Beatles and George Martin (as producer) did with this part metaphysical, part new age anthem for the sixties and beyond. You Never Give Me Your Money begins the first of two McCartney inspired medleys on the album, where 'seguing' apparently seamless tracks together would be one of the most influential and inspiring aspects of the entire production. Lennon later complained that 'bits and pieces' of mostly McCartney's unfinished tracks were banded together to produce a McCartney dominated album. Nevertheless, the results are absolutely incredible for the time. You Never Give Me Your Money kind of reminds us of how McCartney viewed the Beatles fractured business machine as well as their fractured personal relationships. It's a sad and somewhat introspective song that is dealt a crushing blow by the more Lennon dominated Sun King and follow ups Mean Mr Mustard and Polythene Pam with their Lennon typified wit and cynicism laced with abstract humour and superb arrangements. McCartney's She Came In Through The Bathroom Window includes exceptional musicianship fused with his exceptional melodic sequencing, something he would go on to develop further in his later albums but most notably in Ram, Band On The Run, and Venus and Mars. Golden Slumbers begins the second medley and is a highly accomplished rewrite of the traditional lullaby with George Martin's orchestral arrangements and McCartney's rich and expressive vocal style. Carry That Weight is the bridge between where Golden Slumbers tucks you in and where the magnificent The End is the dream you reflect upon for the rest of your life. The End features those spectacularly famous guitar duals and Ringo's innovative drum solo that leaves audio imprints in the memory forever. The lyrical genius in 'and in the end, the love you make is equal to the love you take!' has now become The Beatles own epitaph to the magic and creative innovation that came from one of the finest bands ever to have emerged from one of the finest and most productive recording studios in the world.. Abbey Road. Abbey Road Cover Photo - The Abbey Road cover shoot was scheduled for 10am on Friday 8th August 1969. Iain Macmillan took a total six pictures over a period of only ten minutes while the police held the traffic back. Tittenhurst Park - John and Yoko's home in Ascot, England, was the setting on Friday, August 22, 1969, for the photo session that would be the last to feature all four Beatles together. The American photographer Ethan Russell was accompanied by Monte Fresco of The Daily Mail for the main shots, although additional pictures were taken by Beatle friend and road manager Mal Evans. The event was also filmed and included in The Beatles Anthology documentary as supporting footage for George Harrison's 'Something'. Also present on the day, were a heavily pregnant Linda McCartney (Mary was born six days later). Yoko also attended the session along with Beatles press officer Derek Taylor. The photo session began in front of the main house, the Beatles standing among the pillars supporting the terrace canopy. They then walked down the main garden path, past the Diana statue, to a paddock of high grass (an old cricket pitch), where George, Paul, John, and Ringo stood in a row, being photographed and filmed from all sides. Selected photographs from the photo sessions were issued as promotion material by Apple. Three shots (by Ethan Russell) formed the front and back covers of the Capitol compilation album Hey Jude, issued in the US in February 1970. The shots included the Beatles sitting, and then standing, in front of two arched porches in the southern wall of four terraced cottages and peering from the first floor windows above. Paul McCartney got "Rigby" from the name of a store and "Eleanor" from actress Eleanor Bron. He liked the name "Eleanor Rigby" because it sounded natural. McCartney wasn't sure what this song was going to be about until he came up with the line, "Picks up the rice in a church where a wedding has been." That's when he came up with the story an old, lonely woman. "Father Mackenzie" was originally "Father McCartney." Paul decided he didn't want to freak out his dad and picked a name out of the phone book instead. A string section of 4 violins, 2 violas and 2 cellos were used in recording. Paul may have been inspired by the classic composer Vivaldi. The Beatles didn't play any of the instruments on this. All the music came from the string players, who were hired as session musicians. The last verse was written in the studio. There is a gravestone for an Eleanor Rigby in St. Peter's Churchyard in Wooton, England. (This is where The Quarrymen played and where John and Paul first met). This was originally written as "Miss Daisy Hawkins." The lyrics were brainstormed among The Beatles. In later years, Lennon and McCartney gave different accounts of who contributed more of the words to this. Microphones were placed very close to the instruments to create and unusual sound. Ray Charles and Aretha Franklin both had hits with cover versions of this. Because of the string section, this was difficult to play live, which The Beatles never did. On his 2002 Back In The US tour, Paul McCartney played this without the strings. Keyboards were used to compensate. According to A Hard Day's Write by Steve Turner, many Americans concluded the 'ticket' was from British Railways, and 'ride' was the town of 'Ryde' on the Isle of Wight. McCartney confessed to his biographer (Barry Miles) that they were partly right. Paul had a cousin who ran a bar in Ryde and he and John had visited them there. Paul later mentioned that although the song was primarily about a girl riding out of the life of the narrator, they were conscious of the potential for a double meaning. Don Short, who traveled with the Beatles in the '60s, recalled that John coined the phrase "Ticket to Ride" for another meaning - The girls who worked the streets in Hamburg had to have a clean bill of health and the authorities would give them a card saying they were clean. Don later said that although he specifically recalls John telling him that, John could of been joking - you had to be careful with him like that. John Lennon: "That was one of the earliest heavy-metal records made." The brief, but recognizable guitar solo was played by Paul McCartney, who was The Beatles bass player. This was used in the Beatles movie Help! in the scene where The Beatles ski... poorly. This was the first Beatles song that was over 3 minutes long. The Beatles played this on an episode of Ed Sullivan Show that aired September 12, 1965. It was the last Ed Sullivan show broadcast in black and white. The Beatles were in America for their big Shea stadium concert. The Carpenters covered this in 1969. It was their first single and also the name of their debut album.